A new release is available now. 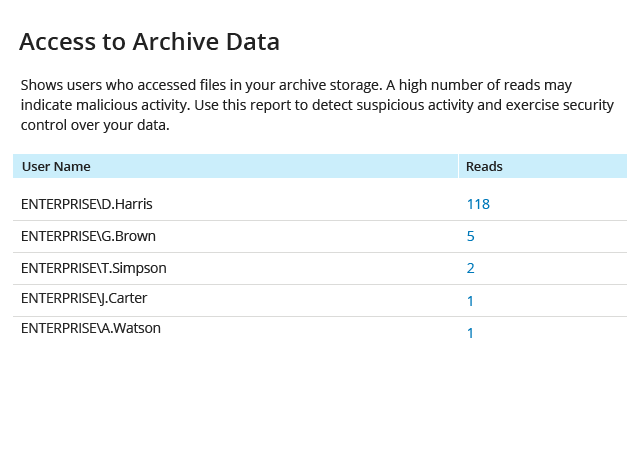 Find out what’s new in Netwrix Auditor – Data Discovery & Classification Edition. Delivers actionable intelligence about what’s going on in Azure Active Directory, enabling you to detect and investigate unauthorized changes to security settings, privilege escalation and suspicious access to Azure applications in time to make a difference. 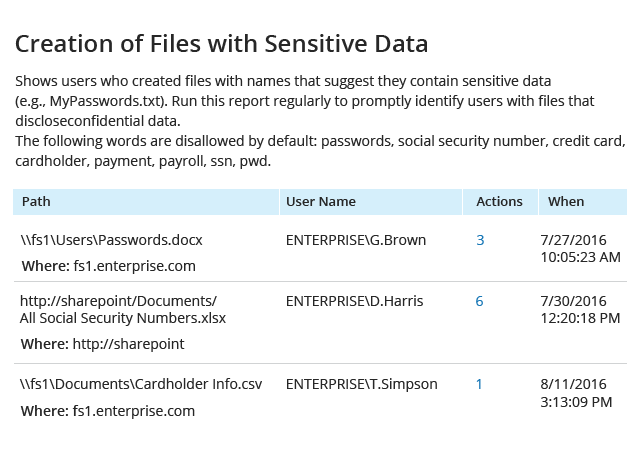 Provides security intelligence about user behavior in SharePoint Online, so you can easily identify inappropriate data access and promptly take steps to prevent leaks of sensitive information. and remediate threats to structured data. 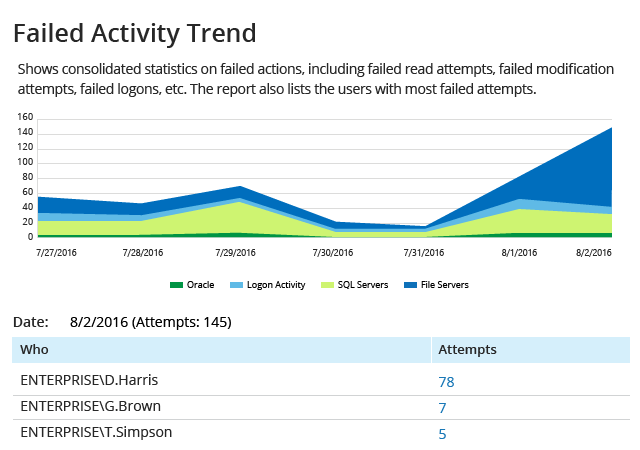 Gives you visibility you can trust into what users and DBAs are doing in your Oracle databases, so you can quickly spot anomalous behavior and take action before a data breach occurs. Strengthens your control over highly privileged users, giving you confidence that you can detect any unauthorized access to your SQL databases. and respond to incidents efficiently. 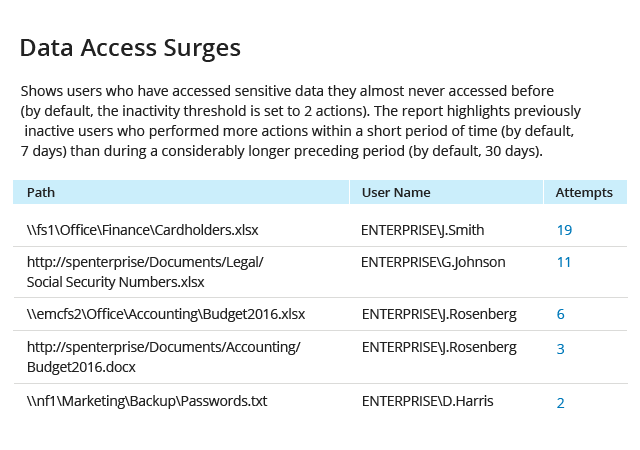 Has there been any abnormal access to sensitive data? Is anyone accessing stale data? Have there been any unusual spikes in failed activity? 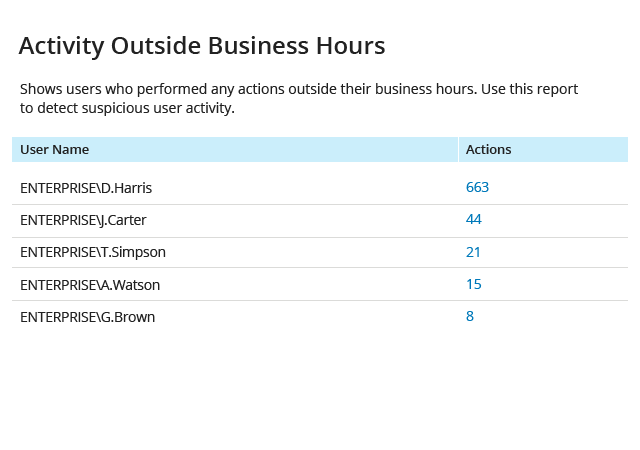 Who is active outside of business hours? Has anyone put harmful files on corporate data storage? Are there any files likely to contain PII or other sensitive data? Maximize the value of your existing security applications by feeding them granular audit data from Netwrix Auditor. Visit the Netwrix Auditor Add-on Store to discover free add-ons for integrating with the leading SIEM systems. 360-degree visibility for detecting & investigating abnormal user behavior.